American artist Jon Rubin invited to co-create the third neighbourhood dialogue initiative. 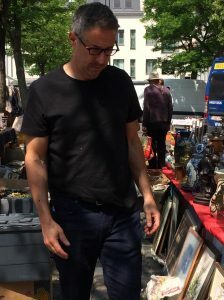 Jon Rubin recently came to Brussels for the research visit regarding the 3rd neighbourhood dialogue project with the working title “Transatlantic art lab” made possible with support from the German Marshall Fund of the United States (Transatlantic Leadership Initiatives Alumni Grants*). The objective of the research visit was to identify locally relevant topics and themes for a transatlantic exchange that will strengthen neighbourhoods on both sides of the Atlantic. In Brussels experience and conclusions from previous programme projects were shared with Jon and he visited the neighbourhood and talked to locals. 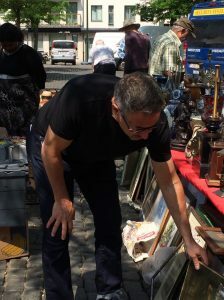 Jon says “I was particularly struck by the Vieux Marche, La Place du Jeu de Balle, in the Marolles neighbourhood. There is a social model within the market that seems to function more organically than that of the larger neighbourhood and economically smoother than that of the labyrinthine structure of the city and state”. The next step is to go to Cleveland in the US to do continued research there, because the 3rd neighbourhood dialogue gets a transatlantic perspective with the exchange between a Cleveland neighbourhood and the Marolles in Brussels; how can communities be reinforced by a transatlantic exchange? Jon Rubin was trained in fine arts and he started his career as a painter. Today, and since 25 years back, he is working with contextual art. As Jon was interested in politics and the society he decided to change practice as he felt a need for channeling his interests through art in another way. Today Jon is a praised for his social art practice. Recently he delivered a project “…Circle Through New York” (together with artist Lenka Clayton) for the Solomon R. Guggenheim Museum. The project sought to create dialogues across perceived cultural, economic and geographic boundaries as well as among entities with different civil functions. The project was made possible through a generous grant to Guggenheim’s Social Practice Programme from the Edmond de Rothschild Foundations. Another of Jon’s recent projects is “Conflict Kitchen” (with Dawn Weleski); a restaurant that only served cuisine from countries with which the United States is in conflict. The restaurant rotated identities every few months in relation to current geopolitical events. Each Conflict Kitchen iteration was augmented by events, performances, and discussions that sought to expand the engagement the public has with the culture, politics, and issues at stake within the focus country. The value of art, social practice and the role of the artist in the society is something that Arts Lab Brussels explores since its start. This is also at the core of the “neighbourhood dialogue programme”* that took off in 2016. The programme is co-created with different artists; the first with Swedish artist Patrik Qvist, “Everyone an activist” and made locals interact on the topic of environment, climate change and local social environment. The second project “If I had Wings” departs from a public space installation by Finnish artist Kaarina Kaikkonen aiming to inspire locals to reflect upon their identity, the identity of the neighbourhood and the right to the common space shared. As with Jon Rubin’s previous projects these initiatives are focused on process and not product. Today there is still a great challenge for these kind of projects with limited enlightenment from non creative sector’s and from politicians on what artists actually can contribute with outside art galleries and museums. When will they understand that it is in the intersection of disciplines, sectors and cultures innovation happens? Managers for Transatlantic art lab : Johanna Suo, ifa laboratory, Brussels and Arlene Watson, FRONT, Cleveland. This project is supported financially by the German Marshall Fund of the United States and implemented by alumni of its leadership programs. GMF offers a portfolio of leadership development initiatives for established, mid-career, and next generation leaders who are committed to strengthening transatlantic relations to make a free, prosperous, and peaceful world possible. Upon successful graduation from one of these programs, participants join a 4-thousand strong GMF alumni network that deploys their talents to advance democracy, inclusive leadership, and global engagement for a new century of transatlantic collaboration. Opinions expressed in this publication do not necessarily represent those of the German Marshall Fund of the United States, or its partners. Thank you Renaissance Hotel Brussels, Marriott International. © ifa laboratory 2016 – 2018. All rights reserved. ifa laboratory is a member of NICE. The Network for Innovations in Culture and Creativity in Europe (NICE) was set up in 2013 as a smart, cross-sector consortium of 15 cities, universities, agencies and prominent individuals from eight countries, under the lead of the european centre for creative economy (ecce) in Dortmund. Please see more information clicking on the logotype.